Piggle Wiggle and the Bengal cat are racing towards some mine surveyors. What are the surveyors doing? What are the surveyors using to measure the big cavity? Some holes underground (also called cavities) are natural, like caves. Others are man-made, like train tunnels or storage facilities for gases. When cavities need to be measured, the quickest, easiest and safest way to do that is to use specialist equipment. This particular tool is called the C-ALS Cavity Auto-scanning Laser System. It will scan the inside of the cave, and measure it, which means that humans won’t have to go and do it. It’s being lowered into the cavity by the two mine surveyors… do you think they’re about to get a big shock?! Where is Bernard the brown bear, and who do you think he has seen? Bernard is standing on top of the Orica blasting truck. (Blasting uses carefully controlled explosives to help miners get at the rocks and minerals in the earth, which are then used to build houses and roads.) Bernard is waving to a mine surveyor, who is operating some equipment on a three-legged tripod. This equipment is helping the surveyor to measure the distances across the mine, between the benches. But these aren’t the kind of benches you see in the park! These benches are a series of steps or ledges, just like a staircase, which are cut into the earth so that miners can go deeper. This is an ‘open cast’ mine, also called an ‘open pit’ mine, which means that the miners don’t have to go under the ground – they just cut the rock away so they always stay on the surface. By measuring the distances across this open cast mine, the surveyor can calculate the mine’s volume and height, so he’ll know exactly how big it is. He’ll also know its precise location on a map, so the company can make sure that its miners don’t accidentally take things out of the ground which were lying outside of the mining area. And thanks to their training and specialist equipment, surveyors can do all of this very safely. Did you know that we need miners to help us clean our teeth? Yep, there’s an ingredient in toothpaste which needs to be mined out of the ground. It’s called hydrated silica (which is the same thing as opal, which is a gemstone often used in jewellery). Harry the wombat likes dark, wet areas. What has he found down there? Harry has discovered a fantastic little device called the ‘Zeb Revo’, which is made by a company called GeoSLAM Technology. This Zeb Revo has been mounted onto the top of a robotic vehicle, and is being used to automatically measure the inside of this cave tunnel. Usually this kind of scanning device is hand-held, but being attached to a robot means it can get into really small spaces like this low tunnel, so the surveyor doesn’t need to go underground. Here, this scanner is helping to monitor cave tunnels which could be dangerous to miners when they are working underground. You can watch a video about this! Can you spot Sven the Viking? He’s controlling something with his computer. What do you think it is, and what’s it for? Sven isn’t controlling the dragon – he doesn’t even seem bothered by it! (That’s how cool surveyors are). Instead, Sven is controlling the really amazing robot to which the Zeb Revo has been attached. The robot is trundling along in an underground cave beneath his feet. Can you seen the caterpillar treads on the robot? Why do you think these might be needed? Can you find Captain Alice? What’s she showing the mine surveyor? Can you count how many ‘monitoring prisms’ there are? What do you think they’re for? There are 9 prisms in this picture. Did you spot them? They’re not that easy to see! They’re set into the walls of the mines, from left to right. The prisms act like targets, as well as like mirrors. You point your surveying equipment at them, which then sends out a ‘beam’ towards the prism. The beam bounces back off the ‘mirror’, and comes back to the equipment. The distance the beam has travelled is measured by the equipment, and then that number is halved, or divided by two, in order to know how far the walls are from the point where the equipment was placed. Why do you think the measurement is halved? It’s because the beam goes to the wall, and then back again. If you have to walk a mile to your friend’s house, and then a mile back, that doesn’t mean your friend lives two miles away, does it? This particular piece of equipment is called a ‘total-station theodolite’. 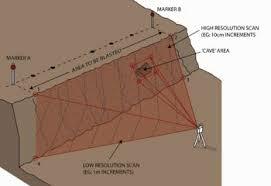 By doing these measurements regularly, we can monitor the mine walls and see if any of the distances are changing. Sometimes mine walls can shift, and we need to know about that in case it means the mine is becoming unsafe. You can find out more here. Open cast mines can be really huge, so using a plane can be the best way to map the site. How do you like this plane? The plane is flying over the mine to measure it. This is just a different but super-zoomy way to survey the size of the mine. It uses aerial photographs plus special equipment known as ‘airborne LiDAR’. LiDAR stands for ‘light detection and ranging’, and it’s pretty much the same as radar (which is really cool). Basically, the LiDAR scanner sends a laser beam, or pulse, down to the ground, and then the light particles bounce back to the scanner. That way, you can measure how far the pulse travelled and how big the mine is. You can also use LiDAR scanners on the ground, under the ground, and in water! Why is the someone scanning the rock face? Can you see the mine surveyor doing this? He’s just behind Robert (who is riding Buck, the brown horse). This particular mine surveyor is known as a blast engineer. Blast engineers put explosives down holes drilled into the rock face. They need to measure the amount of rock between those holes and the face of the rock, in order to know how much explosive to use. If they use too much, rocks will fly, which will be very dangerous. If they use too little, they’ll have to do it all again. So this surveyor is relying on his blue and white laser scanner to help him get it exactly right. Can you find the engineers making stockpiles?